Weather has a nasty habit of turning otherwise clear bodies of water into stained, dirty or downright “chocolate milk” fishing conditions. Using blade baits and scent products is one way the Fishing 411 crew consistently catches walleye in these tough conditions. Most walleye fishermen agree that dirty water is the kiss of death. It’s true that walleye are sight feeders and in dirty water conditions they are generally much tougher to catch. The thing about fishing I often remind anglers is there are no absolutes. In other words, never say never! In dirty water there are ways to catch walleye that are surprisingly effective. 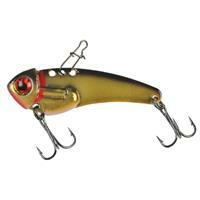 Blade baits are made from a stamped piece of metal with a molded lead weight on the bottom. Some blade baits are equipped with “double hooks” similar to those bass fishermen use for fishing plastic frogs, but most blade baits are equipped with two treble hooks. 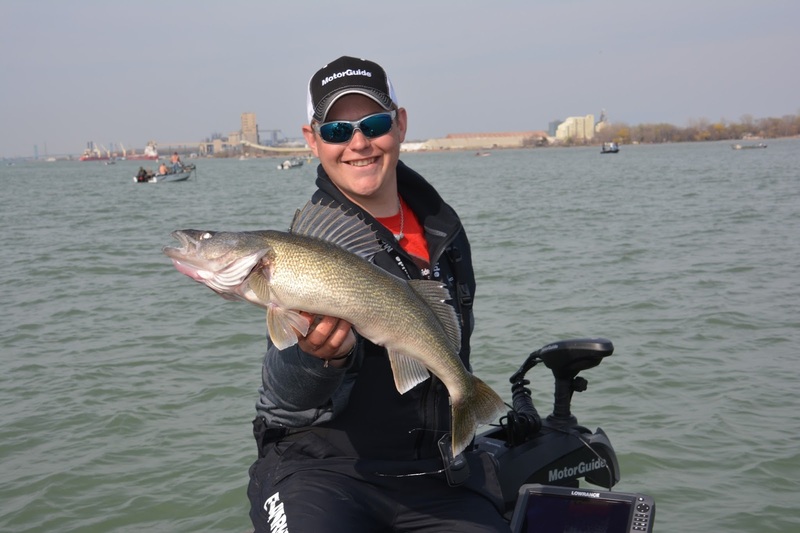 targeting walleye in dirty water conditions. The tail treble hook tends to be larger and the hook on the belly is a little smaller. This hooking arrangement helps keep the two treble hooks from tangling with one another and also the fishing line from catching on the hooks while jigging. Because blades can be casted long distances, they are often used to cover water quickly. When casting it’s best to make a long cast and allow the blade bait to sink to bottom. Reel up the slack line and when the rod tip loads from the weight of the lure, raise the rod tip about a foot, pause and let the blade sink bait to bottom. This simple retrieve brings out the famous action of the blade bait. Blades have a tight vibration that readily telegraphs up the line and can easily be felt in the rod. When the blade can be felt vibrating all is good. The second the line goes dead, chances are the blade bait has picked up debris from the bottom or the line has become tangled in the hooks. Blade baits typically deliver violent strikes much like a walleye hitting a crankbait. Casting is one approach, but drifting and vertical jigging is another way blade baits excel. Vertical jigging makes it easier for the angler to maintain contact with bottom while controlling the lift and drop rate of the bait. This more controlled presentation allows the vibration of the blade to do it’s work and just about eliminates problems with the line fouling on the hooks. The most effective way to vertical jig a blade bait is something called “tight line jigging” that involves lifting the bait just a few inches off bottom and then dropping the bait back to bottom on a tight line. Most anglers work the blade too aggressively and end up spending most of their time untangling the fishing line from the hooks. One of the reasons blades work so well in dirty water is the violent vibration pulls in fish that can’t see the bait, but they certainly can “feel” it. When “tight lining” the bait it makes it easier for fish to zero in on the lure. Another lure group that performs well in dirty water conditions are known as attractor jigs. These lead head jigs feature props, blades, flippers or other attractors that make them easier for fish to see, feel and hear in dirty water. Combining these jigs with a soft plastic “swimbait” tail is a great way to increase the overall size of the presentation and also add in a thumping vibration from the paddle tail. Selecting brightly colored jigs and plastic bodies is a must when fishing in dirty water. Black and purple are also colors that contrast well against dirty water. when fishing in dirty water conditions. Many anglers feel the best way to approach dirty water is to slow down and use live bait or cut bait. Certainly having a “scent stream” in the water will help when fishing dirty water. The natural scent of a live minnow is a good place to start, but there are lots of unique “scent products” on the market that can enhance the scent stream. Pro Cure, one of the leading fishing scent manufacturers suggests injecting pure fish oils into baits when fishing with both live and dead minnows. 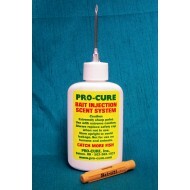 Pro Cure produces both the oils and injector hardware for this style of fishing. Another option is to enhance live and cut baits by using baitfish dyes that make the baits more visible to fish in dirty water. Again Pro Cure is a leader in this department and their Bad Azz Color Blast is a UV and color enhancement that comes in orange, pink, chartreuse/line, blue and purple colors. 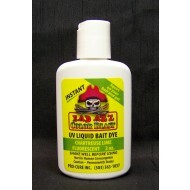 One little squirt of this bait dye turns a minnow brilliant color and also adds a UV visual attractant. to fish when targeting dirty water. Fishing scents are not just limited to live bait and cut bait. Blade baits can also be enhanced by applying paste style scents to these lures. Most liquid fishing scents wash off hard baits almost as quickly as they hit the water. The Pro Cure Super Gel series of fishing scents are sticky and designed to adhere to hard baits, soft plastics and even live bait. A little dab will produce a powerful scent stream in the water for about 30-40 minutes before it is necessary to re-apply. Made from real bait fish, Super Gel is made from dozens of different baitfish species. Some of the more popular Super Gel choices among walleye anglers are Emerald Shiner, Alewife, Gizzard Shad, Smelt and Minnow. Fishing in dirty water is something that walleye anglers don’t look forward to. Sight feeders like walleye are easier to catch in clear to stained water, but they can be caught even in dirty water when the right lures and scent products are used.